Comfortable family living with two fireplaces (one wood burning and one gas). Two decks - one with a view of the ski mountain and one backs to a wooded park area. A Jacuzzi tub in the main bath. Summer, there are four tennis courts, and, winter, the town sledding hill in the park directly behind the cabin. 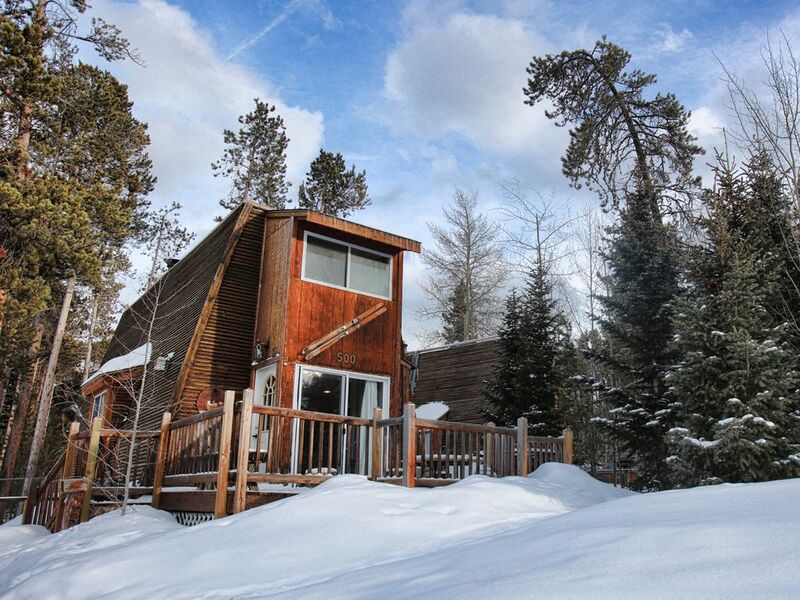 One of the only cabins in the Town of Breckenridge but convenient to all attractions, shopping and restaurants. Town of Breckenridge Carter Park directly behind cabin with wooded access to park and hiking trails in summer and sledding hill in winter. Free Wi-Fi included. Bathroom 1 upstairs has Jacuzzi tub. Bathroom 2 has a shower. Two short blocks to Main Street shops and restaurants. view of Peak 8 ski runs from front deck. Bus pick close or short walk to Peak 9 base. Great historic cabin in super location. All amenities provided. Renovations made everything modern while preserving the historic feel of cabin. Super location meant everything was walkable. Would stay again. This was the best Cabin in all of Breckenridge, the location alone made our first ever family ski trip the best it could be. We did not have to use the rental car for any reason during our week stay, as everything was in walking distance (i.e. Main Street and Bus Stop). I could not come up with one complaint about the property other than their were no instructions on where to place the trash, this process may have been self explanatory if we wouldn't have gotten 36 inches of snow and the garbage binds were visible, lol. If you want cozy, convenience and the best Rocky Mountain experience, stay here, as I promise you wont be disappointed. I was even able to Bar-B-Que in the snow on the back porch one evening the temperature was 12 degrees and snowing but this Ragin Cajun from Louisiana pulled it off, thanks VRBO and Warren you guys are the best, we will definitely return someday and stay here!!!! trash shed difficult but makes for great skiing. The cabin is everything we expected and more from the details they provided. It was cozy, warm and comfortable. all the amenities were there and more. Easy access. Parking in front. We had a great time, Thank you Warren. Thanks for this very nice review. Hope you can return. Might try summer when little Monica can enjoy park and school yard. We couldn't have been happier with this cabin. It was the perfect size and in a great location to downtown and the ski lifts. We didn't need our car the whole time we where there, everything is within walking distance. The cabin itself is nicely furnished and very comfortable. On top of all of that the owner was great to work with and very accommodating our special request. I highly recommend staying here for your next trip to Breckenridge. Matt, Thanks for the very nice review. It is a family cabin and we try to treat our guests that way. The location of the cabin was perfect for us. It was the perfect size and really made for an enjoyable trip. This cabin was everything we expected and more. So thankful we found this spot. Non-refundable once paid in full - travel insurance strongly recommended - call owner for rates.